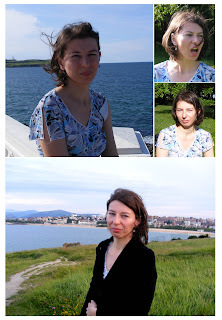 Sangorrin: Larisa in Santander and hill "La Picota"
Larisa in Santander and hill "La Picota"
This weekend my romanian friend Larisa came to visit Santander from Madrid. As she was only staying here for two days we decided to go for the coast on the first day and the next day go to see some hills. 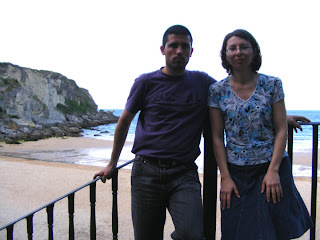 These are Larisa and me in the wonderful beach of Mataleñas, situated between the golf field and the light house. She took a walk along the seashore and felt the cold of the Cantabrian sea on her feet :). I had to take lots of pics of her because somehow she always had her eyes closed on them! It must be a curse or something hehe. 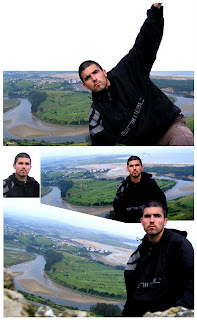 For the hiking day, we took a FEVE train to Mortera-Mompía. 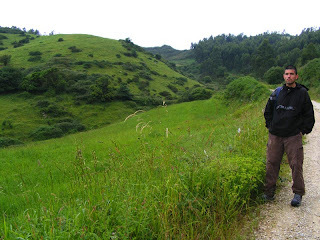 After following the Camino de Santiago for some minutes, the route to the hill "La Picota" starts in the village of Mortera. Although this is a very low hill, the views you can get from La Picota are remarkable. I took a panoramic photo so you can check what you see from there. 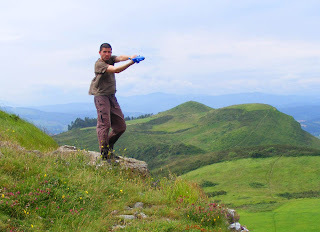 Up in the hill "Monte Torio" I tried to emulate the Atlantean Sword Kata by CONAN, hehe. On the way back home I got on and off in train stops which lacked of ticket vending machines. As the ticket officer didn't show up, the journey was for free!! haha, I love trains, not only they are comfortable, ecologic and cheap but sometimes even free!! I took this funny picture of a house which had an advertisment literally written onto its wall. It says: "Day menu.. Meals and dinners by order... beds... takeaway paella", haha, I wonder who would choose that place to spend a night. hahaha, you must have practised a lot with the "sword", hahaha. See you soon in London!! Sangorrin, I have commented some posts ago, about comics, cartoons and harmonicas. Thanks for your visit, Sangorrin! Wow, that was great at Amsterdan, as in Brussells (CBBD) too. I will post some photos and cartoons from there! Wow, if you come to Brazil, you must go to Sao Paulo to visit the HQ Mix bookstore. Only with cartoons and comics books anda magazines. In my blog of charges you can see some photos of our signing Session of Front Magazine.